(AFP) - Sudanese protesters on Monday sought talks with the army on forming a transitional government, as thousands braved a deadly crackdown by security agents for a third day to urge the military to back them. The northeast African country has been rocked by more than three months of protests that erupted over a hike in bread prices before transforming into nationwide demonstrations against President Omar al-Bashir's iron-fisted 30-year rule. 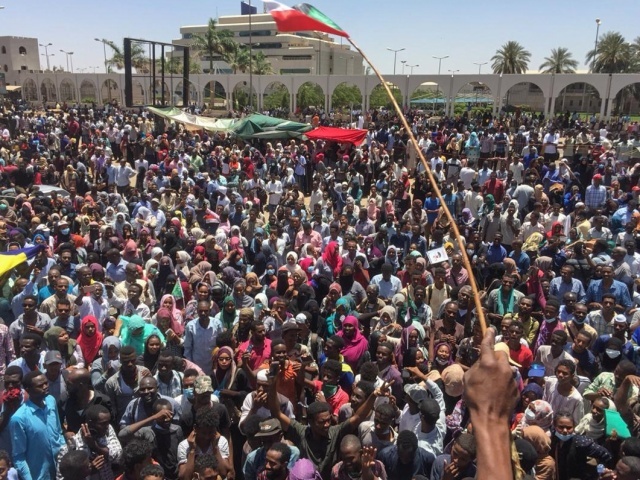 At the biggest rally so far, thousands of protesters have since Saturday been camped out around the army headquarters in Khartoum which also houses Bashir's residence and the defence ministry. They are calling on the military to protect them and to back calls for Bashir to resign. "When the army is here, we have no fear," protesters flashing victory signs chanted as military vehicles with soldiers fanned out around the complex, onlookers said. Riot police have fired tear gas at the protesters, but they have failed to dislodge them. Interior Minister Bushara Juma said seven protesters died on Saturday when forces tried to disperse them and 15 were wounded along with 42 members of the security forces. In all, 2,496 protesters were arrested. Defence Minister General Awad Ibnouf vowed to preserve the security and stability of Sudan. "Sudan's armed forces understand the reasons for the demonstrations and is not against the demands and aspirations of the citizens, but it will not allow the country to fall into chaos," Ibnouf told the top brass at a meeting, according to the official SUNA news agency. Digeir said the protest organisers had also formed a council to initiate talks with security forces and the international community aimed at agreeing a transition that gives power to a "transitional government that represents the wish of the revolution". Soldiers put up barricades in streets near the army compound after reinforcements of intelligence agency members and riot police arrived in the early hours, witnesses told AFP. "After that, security forces began firing tear gas at protesters," one said on condition of anonymity. Gunshots were also heard, witnesses said, but it was unclear who fired. Protest organisers urged the military to protect the demonstrators. "We want you, the young officers and soldiers, to remain committed to the role of the national army, which is of protecting the people," said the Sudanese Professionals Association. Protest organisers urged the residents of Khartoum and nearby areas to join the demonstrators. Crowds of people carrying food and water were later seen walking towards the complex to take part in the protest, according to onlookers.